Hard working, stylish and so convenient it can stay right in your workspace! The wide grip, soft-touch lever makes punching large quantities 50% easier. Superior cutting action with patented pin technology delivers clean and precise 9/32" holes. Lever locks down for space-saving convenience and has durable metal construction for long lasting performance. Multiple hole placements offer exceptional flexibility. Easy-glide chip holder prevents messy spills. Limited lifetime warranty. This is a an EXCELLENT hole punch! It is fool proof, and really easy to use. It has a guide for your papers, so you get the same punch every time. Exactly what I was looking for! GREAT SHEET CAPACITY. With a capacity of 20 sheets of 20lb paper, this punch delivers the perfect balance of capacity and flexibility. Built for performance, it consistently handles all your documents with a single punching experience. EASY CHIP MANAGEMENT. Let’s not let the little things get in the way of a good punching experience. Keep those chips where they belong with the easy-glide chip holder that makes emptying a cinch. No more messy spills! EXCEPTIONAL PUNCH HEAD FLEXIBILITY. It’s time for one desktop punch that can handle the full range of your punching needs. Whatever the job calls for- two-hole, three-hole, seven-hole. The Light Touch High Capacity Punch’s adjustable punch head position and multiple hole placements ensure you’re always up for the task. SPACE-SAVING CONVENIENCE. Like a trusted friend. the Light Touch High Capacity Punch is there when you need it and gives you your space when you don’t. The wide-grip, soft-touch lever locks down easily and smoothly for the space-saving convenience, freeing up valuable workspace for the next task at hand. 50% LESS PUNCHING EFFORT. Punching your presentation or reports shouldn’t be hard work. We’ve made it easy-with the wide grip, soft touch lever action of the Light Touch High Capacity Punch. Discover 50% less punching effort- whether you’re punching five sheets or 20 sheets. It’s always smooth, consistent, ergonomically efficient and just plain easy. 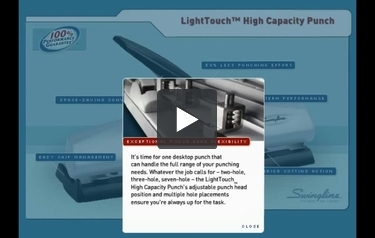 The Light Touch High Capacity Punch is designed for long term performance. Built with durable, all metal internal mechanism, it benefits from decades of Swingline engineering excellence: an on going commitment to performance, design, durability, and innovation in the workplace. Contemporary style, timeless functionality. LONG-TERM PERFORMANCE. Swingline patented pin technology ensures clean, precise 9/32? cuts that deliver consistency to your workflow and reliability to your everyday punching needs. Sharp cleans holes from your punch, sharp clean documents for your office. Will this unit make 7 holes in the 8 1/2" (by 5 1/2") Day Planner size sheets? Thank you for your question. No, the Swingline Black/Silver LightTouch High Capacity 2-7 Hole Punch - 74030 will not be able to punch holes close enough together to fit 7 holes on the 8.5" side. I do not know how to adjust hole punch placement or add more holes. Thank you for reaching out. Assuming you have purchased more punch heads, item A7074865, you can add punch heads to any of the designated slots on the top of the punch. All you have to do is remove the screw from the punch head, slide the punch head to wherever you want the punch head, and then tighten the screw. I have also attached the instructions to this email. Hope this helps. The middle hole is not punching entirely through the paper. It appears the round metal piece is not getting pushed all the way down. How to adjust? You may have a worn out punch head. The replacement number for the punch head is A7074865. There are 7 holes to make the punch adjustable depending on how much holes you are punching. Is there a guide for positioning the paper to punch 2 holes in the top of the paper? Unfortunately, this punch does not have a paper guide. How do I assemble the punching units? To add punch heads, first find the desired location of where you want your punch head to go. There are slots on the punch where the heads can go. Find the slot you would like to use and hold the punch head over the slot.If you turn the punch over you will see holes on the bottom where you can screw the punch head in. I purchased this punch and I can not find the plastic piece to unlock it. Where is it?? On the back of the punch is a locked padlock and an unlocked padlock. Hold the handle down and slide toward the unlocked padlock to unlock your punch. with the current 3 hole setup I can't punch more than 3 holes. How or where can I purchase additional punches to to more than 3 holes on a sheet of paper? You can view all of our punches on www.swingline.com to see which items best fit your needs, but our Heavy Duty Punch (item #A7074450) can be converted between a 2, 3 and 4 hole punch. This can be purchased through our Web site as well. Unsure how to adjust it to become 2 hole puncher? If you turn the punch over, you should be able use a screw driver to unscrew the punch heads. Once they have loosened, you can then move the punch heads to one of the other hole positions and screw it in. I can't tell where to line up letter size paper so holes are lined up with 3-ring binder. The paper should line up right in between the two silver bars at each end of the punch. Take a paper clip and open it up (so it is straight), it will catch the edge and you can pick it out. Also you can try putting some tacky finger on the end of a pencil eraser and spin it on the paper. I hope this helps. How use this punch for legal paper size ?????? that punch is designed specifically for letter-sized paper. However, you can always fold over the excess length of a legal sheet to allow it to fit into the openign on the punch. just purchased this punch; how do I unlock it, for use? Look for a plastic piece on the front of the punch. Pull out this plastic piece to unlock and use the punch.